Hosed: adj. – A somewhat humorous variant of “down”, used primarily by Unix hackers. “Hosed” implies a condition thought to be relatively easy to reverse. It is also widely used of people in the mainstream sense of “in an extremely unfortunate situation”. The term was popularized by fighter pilots referring to being hosed by machine gun fire (date?). Usage in hackerdom dates back to the 1970s or earlier. Have you ever gone to the old trusty computer, hit the power button and received a message, “No Operating System Found”, or see nothing but a white curser on a black screen? Of course you have. Hopefully, you’re savvy enough to remember the F8 command to access the Advanced Boot Options menu but what if you’re not, or what if none of those options worked? It only takes a couple of minutes to make a rescue disc and once you’re finished you can stick it in a safe place for use when you’re getting that “I’m hosed” feeling. 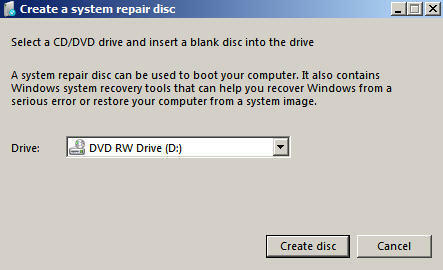 OPTION # 1 Create A Windows 7 Rescue Disk. 1. 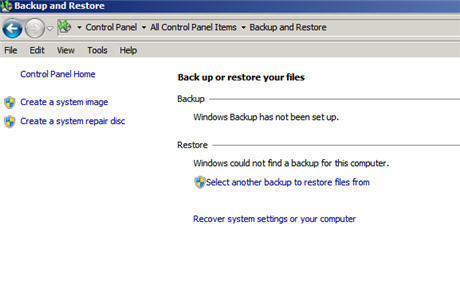 Go to: Start/Control Panel/BackUp and Restore/Create a system repair disc/. 2. Place a DVD into your burner and once you have selected the correct drive from the drop down, click Create disc. 3. 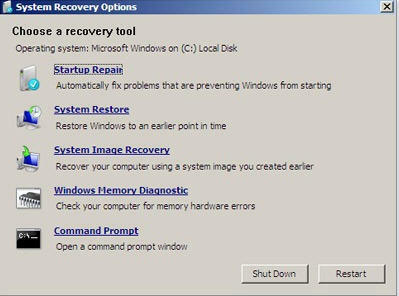 Windows 7 will create its own repair disk and it only takes a few minutes. It’s that easy. For a no boot situation I would start with the first option, “StartUp Repair”, and go from there. With any luck you will be able to repair the boot sector or even use a restore point. But what happens if that doesn’t work. Are you getting that “I’m hosed” feeling again? Don’t worry, I’ve got another trick up my sleeve. This time we’re bringing Ubuntu to the rescue. That’s right, an Open Source Operating system on a CD to help save the day. It’s easy and here’s how. 1. Download the ISO file. I just create a folder on the desktop that says Ubuntu and download to that location. Depending on your download speed it could take as long as 60 minutes to complete. 2. Burn the Disc Image. Once the download is finished simply right click the ISO file and choose “Burn Disc Image”. Windows 7 will identify the file correctly and burn the image as a bootable DVD. You will of course need to supply a blank DVD to the burner and direct windows to the correct Drive. 3. Use the Disc. Simply reboot to the DVD and select from the following options. The first option will allow you to use Ubuntu from the DVD without installing it on your system. From the Ubuntu desktop you will be able to select: Places/Computer/Hard Drive/User/Name/Documents to access your saved pics or other information. It’s easy to navigate from folder to folder to access and remove the information you need. For Windows users the desktop will look a little barren but take your time and you’ll find what you need. There is even an installation of FireFox on the desktop that is ready to go. Put these rescue discs in a safe place and avoid that “I’m hosed” feeling. The Pit Blog machine gun fire, mainstream sense, old trusty, trusty computer, unix hackers. permalink. I have installed Ubuntu 10.10 on a separate partition of my PC which had Windows 7 installed on another drive. But after rebooting I had no option to choose Ubuntu or Windows. What should I do? My parents Windows XP machine won’t boot (says it’s corrupt, stops itself before windows loads). I’m no Windows expert and can’t sort it out, but I thought if I install Ubuntu for them they’d be alright….but can anyone tell me in very simple terms the procedure I need to go through, especially the stage where I can ensure I can retrieve all their data (mostly photos. They do have back up system but I’ve not guarantee it’s actually be working lately). Ubuntu saved my life! Or at least my wife’s laptop and more importantly, her data. For the first comment – the guy who stated his client’s partition was undiscoverable – there are other solutions when a HD or partition is undiscoverable: this situation is usually caused because of a damaged/corrupted system file (e.g. the FAT table on a FAT32 drive) and no, Ubuntu might not see the drive. The solution is to use a DATA RECOVERY program. There are a number of those on the market. I’ve previously done this, at least twice – once with an external HD that was undiscoverable (the reason was a power interruption during writing to the HD, i.e. the USB was momentarily disconnected while copying files to the drive), once with an internal partition that was inaccessible, and once with a folder under “My Pictures” that was inaccessible. I used various programs, including (I think the name is right?) Stellar Phoenix, which cost $100 for the license and some open source data recovery programs that did the job just as well but didn’t have as nice an interface. Nevertheless, it is almost always possible to recover EVERYTHING from a “lost” location on your computer WITHOUT the help of a professional, unless there is excessive mechanical damage to the disk. Hey guys. I’m already a Ubuntu and Windows 7 user. I’m currently trying exactly what is written in this article. But I have a problem: most files in the Windows 7 “Documents” folder seem to be protected. I can’t see many files that I know are there. I suppose I need to “show Windows I’m the right user” somehow, so it will grant me access. Just can’t find how. Anybody can help with that? Thanks! I would recommed using Ubuntu 8.04 LTS long term support it is compatialable with most older machines also. I use ubuntu 8.04lts installed on a pen drive to also clean stubborn virus from windows machines and to recover information from windows computers. caution ubuntu or and version of linux will not see a windows hard drive that has not been shut down properly though. utility to make a bootable HD fully identical to the other one or just use one HD as a data back-up, in this case you don’t need twins. In both cases all files are copied including hidden and locked ones. You boot into a windows environment from the cd and you can run all sorts of diagnostic and anti-malware scans. The CD is the operating system and you can even run a computer without a hard drive even installed. It’s a little “Geeky” as you have to build the disc from your own XP CD and a downloaded program, but well worth the effort. I had two XP machines trashed to the boot then immediate crash stage. Used the lightweight ubuntu 7 series iso to rescue both. Run Ibis from CD; save files to USB; insert rescue CD; hit ‘back to factory specs’ option; installed AVG free and Iobit system care; got rid of Norton and all the other bulky unnecessary stuff; not a problem since. I have multiple pc’s at home(both desktop and laptops), on a home network and I use Windows Home Server. If you have an old desktop computer that you’re not using but is still in good shape, go to http://www.newegg.com and in the search at the top type in windows home server and you’ll see that you can purchase the software for $99. That’s what I did a couple of years ago, and it lets you backup everything on all your hard drives every night automatically. If you loose a hard drive, just put in a new one, take the restore disk from the server software and put everything back on that computer, operation system, desktop and everything just like you never had a problem. It’s awesome. I unfortunately had to do this last night. Ubuntu 9.10 might be unstable on machines with low RAM as mine was. The Karmic Koala version I used still has some bugs so a previous version may be preferable. Why not insure total peace of mind by simply cloning the drive to serve as plug-in back up. Clones are easily updated through USB port by keeping desktop files current. I also have an operating system only clone, in the event the laptop has to leave my possession for repairs. Apricorn Drive Clone was an inexpensive and simple process for my laptop. “operations” or some similar term. In addition to the plug-in clones I rely on two external drives for weekly data back up. Guess I better get to work on the rescue disk. By the way Ron, “Your” or “You’re” doesn’t matter because either way you end up being “hosed”. Good stuff. Im gonna go build up my defense arsenal today so I may avoid that your hosed feeling!!! Richard, It sounds like you just copied the file to the DVD. What you need to do is burn an ISO bootable disc. If you are using something other than Windows 7, you can use a free program called Img Burn to burn the ISO file. For those of you who are asking about this method with XP and Vista, yes you can used the Ubuntu disc with them also. “Your Hosed” ??? How about “You’re Hosed” be as literate as you’re tech savvy? Will the option above work in Windows/XP environment? Discovered that it is important to use “Windows Disk Image Burner” and NOT the “Burn” button. Ubuntu boots sucessfully, but with no internet access. For those of us old enough to remember being serious DOS users might well find it easier to use a DOS boot disc. Can you do this same sort of rescue disc with Vista as I do not have Windows 7. Tried this out downloaded and created Ubuntu CD. Accessed the boot menu on my Dell, using F12 selected boot from CD/DVD, after a short hestitation the PC booted to Windows 7 as per normal, not Ubuntu. Can you also use Ubuntu for Windows XP Pro? What about a Windows XP system with a non-blinking cursor on a black screen? Sound like it’s time for the deep freeze. I haven’t tried it but I know some try putting the failed drive in a plastic bag with all the air squished out. Freeze it overnight. Put it back in the system and if it spins up you got about 30 minutes to get the information off. Recently had a client with a hard drive failure. Didn’t use Ubuntu but used a similar Open Source option. Unfortunately the drive had had a hard failure and was not findable at all. Sometimes when your “hosed” you find you’ve drowned. Unfortunately for my client he had not made any specific backups of his data so lost all of his pictures and genealogy information stored on the disk.